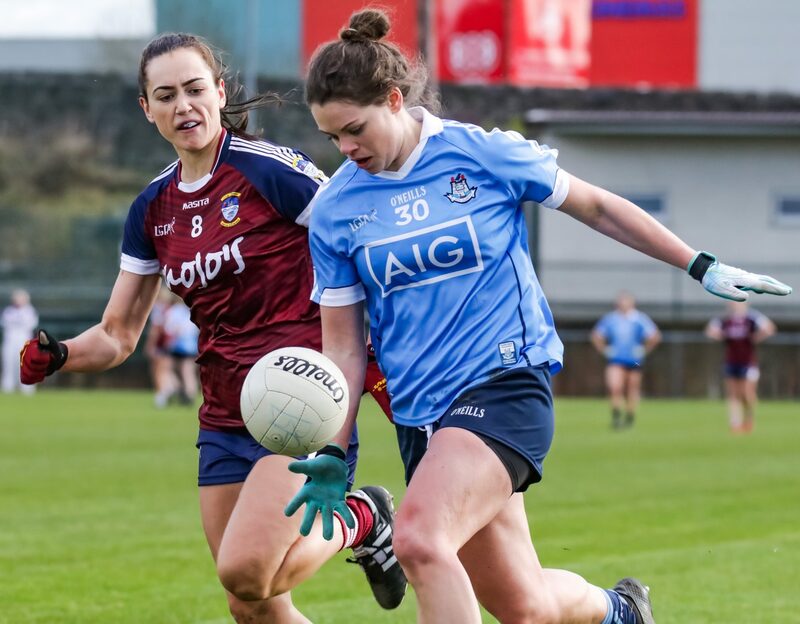 Just as they did last week in Croke Park against Kildare, Jim Gavin’s Dublin side slipped into gear in the second half of last night’s Allianz National Football League game against Tyrone in Omagh to race away from their hosts and claim an impressive victory. Mickey Harte’s Ulster Champions got off to the dream start and led by 1-01 after just five minutes of game. Cathal McShane opened the scoring in the opening minute with a point and three minutes later the same player bore down on the Dublin goal and slotted the ball to the back of the net. Dublin responded with a fine point from Kevin McManamon and a Dean Rock free. But the Tyrone forward line were causing the Dublin defence plenty of headaches on the extremely slippery surface and they added two more points from Connor McAliskey and a Lee Brennan converted free. In the 23rd minute Dublin got right back in the game, a long ball to the square wasn’t cleared by the Tyrone defence and Ciaran Kilkenny was on hand to sweep the lose ball over the goal line for the boys in blue first major of the contest. The game started to get a bit niggly as little flash points started occurring and minds wandered back to the Battle Of Omagh In 2006 when both sets of players piled into each other. But it was nothing more than handbags with players pushing and shoving each other. Referee Maurice Deegan kept a tight lid on things throughout the game and quickly dished out yellow cards for any off the ball incidents. Lee Brennan and Ciaran Kilkenny swapped points but points from Peter Harte and Connor McAliskey sandwiched between a Dean Rock free gave Mickey Harte’s men a two point lead at the break with the scoreboard reading 1-07 to 1-05 in the favour. But Dublin up the anti in the second half and five minutes after the restart the sides were level thanks to a Dean Rock free and an inspirational effort from play by James McCarthy. Dublin now had the bit between the their teeth and hit the front for the first time in the game with a fine point from midfielder Brian Fenton. But they were dealt a blow when Niall Scully was sent off on a second yellow card for a clumsy tackle in the 48th minute. But Jim Gavin’s side continued to drive on a points from McManamon and Kilkenny pushed their lead out to three. 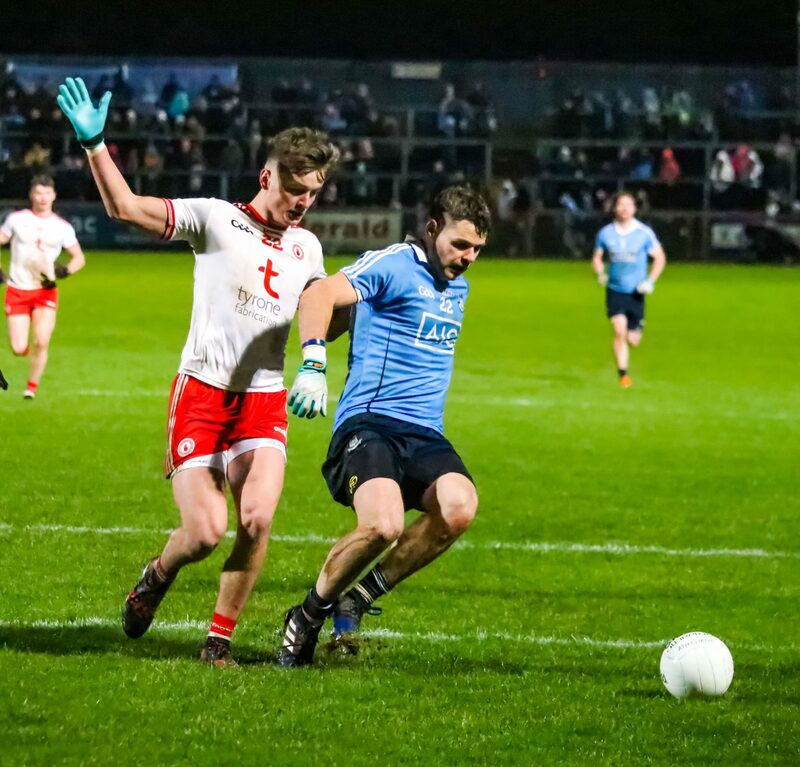 Tyrone though with the extra man were able to break upfield on a number of occasions but Dublin’s disciplined defending and high work rate didn’t allow the men from the Red Hand County any clear scoring opportunities and they were forced into wild shoots and they racked up wide after wide. The one occasion they did breach the Dubs defence they found keeper Stephen Cluxton in no mood to concede any further goals and he made a brilliant save to deny McAliskey when a goal at that stage may have given the Tyrone challenge a much needed boost. Gavin threw on Colm Basquel and Eoghan O’Gara and both made an immediate impact. Basquel clipped over two sumptuous points from play as he continued where he left off last week against Kildare. Although down to 14 Dublin continued to push up on the Tyrone kick out and the pressure told With five minutes to go. Goal keeper Niall Morgan hit short one to Padraig Hampsey, he was immediately pressurised and tried to play the ball back to Morgan who had left his goal line. But Hampsey miss placed the pass and gifted the ball to Basquel who quickly passed the ball to his fellow substitute Eoghan O’Gara who made no mistake and buried the ball to the back of the net. Now seven points to the good and time almost up Dublin just needed to no concede a major down their own end and try as they could Tyrone couldn’t find the space to create a goal chance and despite three late points from Lee Brennan, one from play and two frees the boys in blue coasted to a deserved league win. Next up for Jim Gavin’s side is more northern opposition in the shape of Donegal next weekend in Croke Park.